Saw one of these on the road finally yesterday. Up to this point I had only seen them inside REI or on display at the Yakima booths at trade shows. The mounting system definitely adds a noticeable amount of height. Was a bit odd looking IMO. Any gains that might have been made by having a lower profile with a stowed tent I'm afraid are lost with the mounting height. Some more random observations about the Skyrise medium from unboxing and mocking it up. 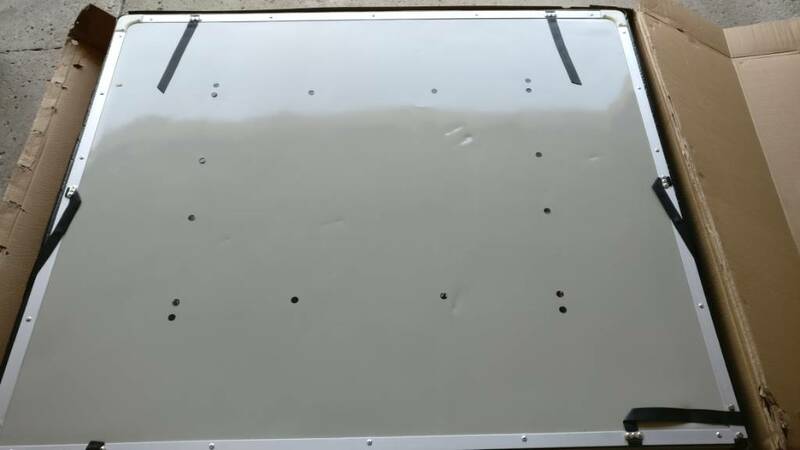 - the support "panels" dent easily and you have to be really careful while handling the tent while mounting/dismounting. This might be true of all non-ruggedized RTTs though. After opening the box I found several dents on both out-facing sides, but not a deal breaker. - the ladder and it's hardware appears to be high quality and weighs 15lbs by itself. Comes with tools required to install. This means the Skyrise medium only weighs about 89lbs without ladder or mounts. - there were aluminum shavings, shoe marks and dirt all over the mattress. Expected a bit more from Yakima quality control. - the rainfly comes attached and is easy to deploy. It is held in place by 8 buckles, and you need to install 8 spring steel poles to form a pagoda-shaped awning. Yakima recommends doing this from inside the tent. - the mattress is 55.5" wide. It will be tight if not impossible to sleep 3 adults with any reasonable level of comfort, but 2+1 kid shouldn't be a problem at all. - the foam mattress has a removable cover. Hard to comment on how comfortable it is without sleeping in it a night, at least. Apparently the tent canopy is not waterproof nor fire retardant? Perhaps you can address that in the upcoming review. This is a bit of a non-sequitur for a few reasons. First, not even a careless coo-coo brain would use a stove in an RTT, and few people dare use a stove in any tent for obvious reasons. Several studies have been compiled, the most comprehensive is from Duke University, about the adverse health risks of most flame retardant coatings as applied to tents over the last 20-30 years. Many companies will not apply those coatings if they can afford not to unless otherwise dictated by some markets that require them. Lastly, even the fire "resistant" tents billed as such will burn pretty quick. I've seen it happen. The coatings are designed to slow the burn, but from what my experience has shown, even a tent with those coatings will go - poooof. As for the waterproof issue, the tent body is not waterproof. The rainfly - is waterproof. 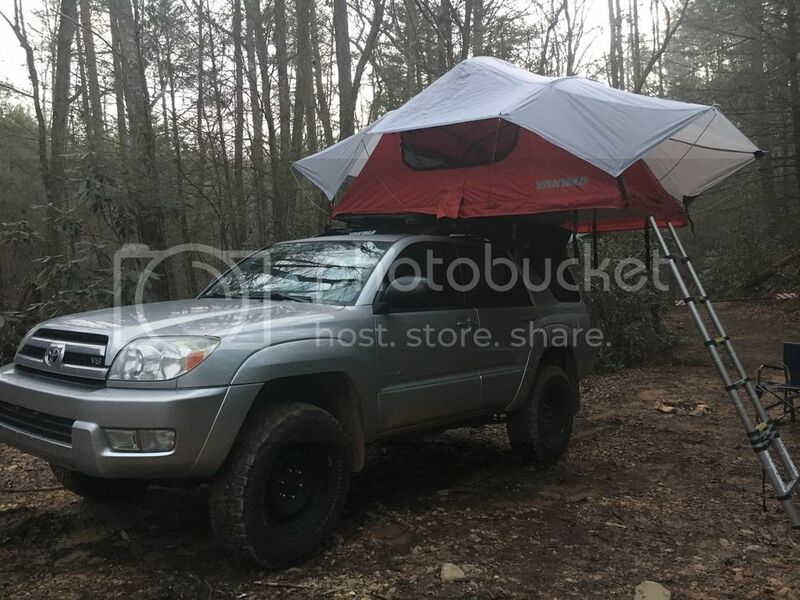 Similar to many RTT designs, and not unlike 90% of ground tents sold. "- the support "panels" dent easily and you have to be really careful while handling the tent while mounting/dismounting. This might be true of all non-ruggedized RTTs though. After opening the box I found several dents on both out-facing sides, but not a deal breaker." Very true. Nothing but cosmetic marks though. After having it on the truck for few weeks, the ladder has also made few marks. "- the foam mattress has a removable cover. Hard to comment on how comfortable it is without sleeping in it a night, at least." Having slept on it the pst couple nights, I can say that it is comfortable! Im used to sleeping pads that tend to slowly deflate and I end up on the ground. It was nice having the skylights as well. "and you need to install 8 spring steel poles to form a pagoda-shaped awning. Yakima recommends doing this from inside the tent." On my 4runner, Ive found its easier to install these from outside. After trying it out a few times in the driveway, I was annoyed by unzipping the windows each time. When I got to camp, I said screw it....and it was much better. Another thing to be concerned about is the fasteners that hold the cover when at camp. I don't see them lasting long hanging while the tent is stowed. Mine are already showing signs of wind damage. Similar but not the same. There are a couple different brands that I'm aware of that are using this (or same design) ladder with the locking tabs on the face of the rung rather than the bottom. Tepui keeps the locking tabs on the bottom of the rung because there is less chance of accidentally hitting one of the locking tabs with your foot when climbing up or down the ladder. Don't want the ladder to collapse at the wrong time. The reason is that there were a number of issues with my tent that I just couldn't get past, the cosmetic dents and dirt/shavings notwithstanding. 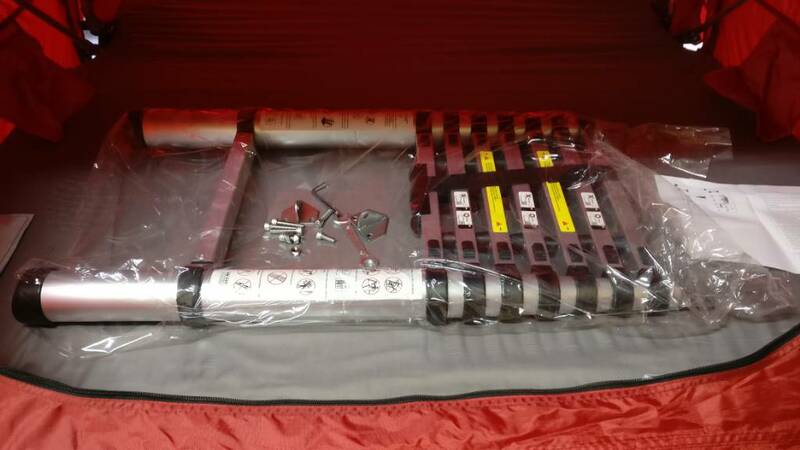 My worst fear when I bought this tent was, did Yakima engineers (stateside, not in China where this is made) really put much time and thought into this? I'm afraid my conclusion is, likely not. Functional Issue #1: One of the corner zippers on the travel cover broke off in my hand the first time I tried to zip it. The tent just wouldn't close fully enough no matter what type of "tuck" we tried with the rainfly and tent material. This would only get worse with 3 peoples' bedding stored inside. Functional Issue #3: We never could get the tent to open a full 180 degrees. Now, I don't know if all RTTs are like that, but after close inspection, one of the two straps that goes along the roof pitch appeared to be sewn too tight, preventing the two extrusions at the hinge from interlocking like they're supposed to. Again this is another durability concern to me, and we weren't sure if this position would be comfortable or not to sleep in. 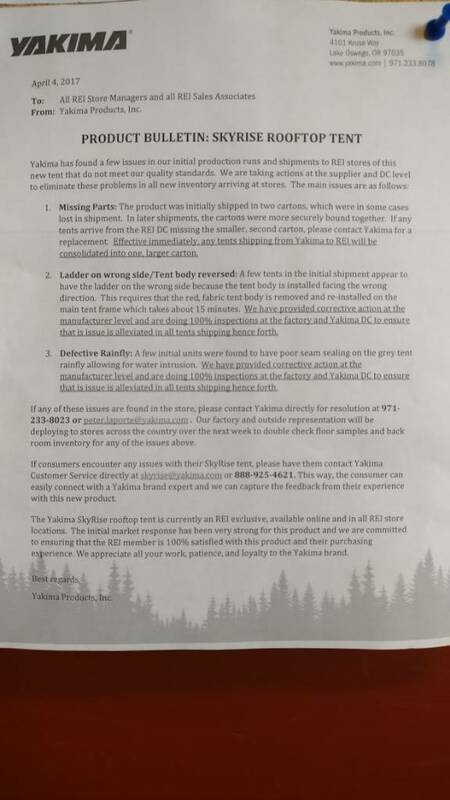 It looks like Yakima are aware of at least some of the issues (see attached picture I took of the bulletin board at the local REI), and doing their due diligence in terms of quality control, but I'm not very convinced that this will resolve any of the fundamental concerns I shared above. I understand the canopy isn't waterproof, either. Wonder what they'll say about that. I am getting one of these for the patriot because of its lighter weight. Its not going to be a multiple open close deal for trips...its go to a spot and stay for 2 days, do some hiking and biking and come back home. Perfect tent for us! I have one and so far have been happy with it. The mattress is comfy and set up is easy enough. I do not like the attachment system on it, but will try to rectify it, and the rainfly rods are hard to take out of the frame after being installed. 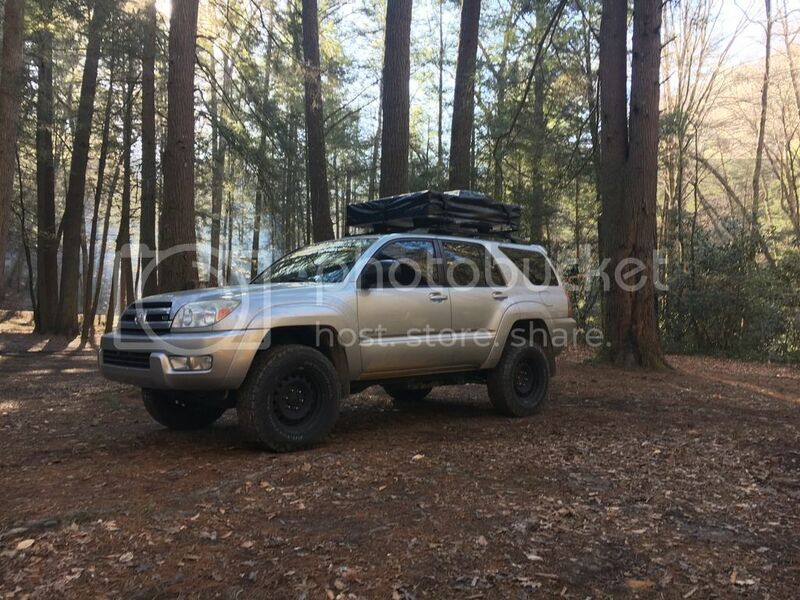 I've had mine for a couple weeks and while I haven't been out camping in it yet, I have been testing all aspects of it on the ground and then on my 2012 Outback since I got it. Austin has been getting dumped on over the last couple weeks so great time to get it figured out. I have mountain biking trips in Texas, North Carolina, New Mexico, and Colorado in June and July so I want to have al the kinks straightened out. So far it has stayed totally dry under really intense rain and driving around with it in the rain, as long as I made sure the inside of the cover didn't collect and water. All the seams and zippers seem to be just fine. No defects or surprises. I waited until the second wave of tents were being shipped to get mine and I think that worked out well. I have a Skyline/Jetstream rack setup and it went on really well. In my case, the slightly taller profile is nice as it makes the space under the tent extension possible to stand under. I also got the Slim Shady awning and have found it to be really straightforward. Really looking forward to using it on these trips. Any word on it performing in the rain? After a few months with the SkyRise, and several opportunities to put it to use, I have my ExPo review live on the home page. This was one of the harder reviews to write. I have evaluated at least 12 leading RTTs in the last two years. I have notebook full of impressions and notations about the good and bad of all of them. I had to refer to that resource to best frame my impressions of the SkyRise. Yakima's tent has taken some serious knocks from the initial round of buyers, and I think many, if not most, of those complaints are warranted. I noticed a handful of shortcomings with the SkyRise as well, although few of them had to do with design attributes. Most of my review demerits had to do with quality control, which is a shame. On the upshot, most of those QC issues were easily overcome with a few quick fixes. The biggest element to frame my review is the price. There are only a couple of other tents at this price range. I don't know if those tents are any better overall, but we recently ordered a couple of them to find out. At the end of the day, an RTT is a very complex product with tons of components. Anyone braving the $1,000 entry point is bound to flirt with negative attributes. It's still a lot of money, but I have to ask myself, how critical would I be of a $200 ground tent? So, within that context, I think the SkyRise is a fine product, and I assume it will only get better as they iron out the manufacturing issues.